You asked and we have the answers! Read the frequently asked questions we receive about our Yonge and Eglinton dentist office and learn more about our financing options. Yes! We welcome you to visit our office for a tour to meet our staff, dentists and see our beautifully renovated office. 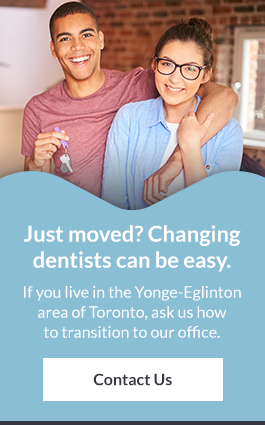 I just moved, how do I switch dentists? Switching dentists is easy! Come in for your first appointment with us. You can either ask your old dentist office to transfer your records, or we can do it for you! We do our best to accommodate our patient's busy schedules. We are open early every day of the week and are open late on Thursdays. We are also conveniently open Fridays and alternating Saturdays. See our contact information for more details. However, it is your ultimate responsibility to arrive for the scheduled appointment. We require a minimum of 2 full business days’ notice to change and/or cancel appointments. Our office is located at 2468 Yonge Street, just 2 major blocks north of Eglinton Avenue. The closest main intersection to our dentist office is at Yonge and Eglinton in Toronto. Our office is accessible by subway and is just 2 blocks away from Eglinton subway station. Parking is available south of the office at Yonge at Roehampton or north of the office at Castlefield. Capitol Dentistry currently accepts all private care insurance plans. In our experience, we’ve seen benefits change from time to time so it’s important to make sure you know what your plan covers. We can also contact your insurance company for a predetermination for any of the treatment that you require before work is scheduled. My insurance company didn’t pay for my treatment – now what? We invoice your insurance provider on your behalf as a courtesy. It is important for you to understand that your coverage is a legal contract between you and your insurance company. Our office is not, and cannot be a part of the legal contract. We require payment in full for your patient portion at the time of your treatment. We accept Mastercard, Visa, American Express, Debit, Cash and Cheque. Yes, we do. Ask us how we can help. What is the best way to budget for my treatment? We’re happy to put together a detailed treatment plan with the associated costs clearly outlined so that you can budget for each appointment accordingly. We can also rank treatments so that you can deal with the most pressing treatments right away and deal with the not-so-pressing treatments over time.